The success of the Amazon Kindle Fire proves the iPad isn't the only tablet people will buy. RIM is hoping that the updated PlayBook OS will help it be a hit for more than just gaming. It's added new features for developers - including the ability to run Android apps as if they were written for the PlayBook so there should be lots more apps showing up in BlackBerry App World - and a new reading mode for the web browser. But what users have really been waiting for are the email, calendar and contacts apps, which promise social networking integration. BlackBerry Bridge goes from the way to get your email to a remote control and Bluetooth keyboard, plus you can print documents to your PlayBook from a PC. Put it all together and you have RIM's second bite at the tablet market; how does it shape up? The upgrade is painless, if a little slow to download and apply (after restarting you have to download a second much smaller update as well). You don't need to reinstall apps after the update and your documents and media will still be there too. The look of the PlayBook 2.0 OS is much the same, but the app launcher is much more flexible. Gone are the preset All, Favorites, Media and Games tabs, in favour of letting you create your own folders to organise apps into categories plus a dock at the bottom of the home screen where you can pin up to six apps or folders for quick access. There are also welcome improvements to the keyboard which now predicts the word you're typing (based on what you type most), autocorrects and automatically capitalizes like a real BlackBerry keyboard. Of course, if you prefer, with the new version of the Bridge app you can use a real BlackBerry keyboard to type. The email client shows off everything RIM has been promising with PlayBook 2, and does rather more than just email. The Cascades-based interface isn't flashy but it makes good use of the screen with extra columns appearing smoothly as you move between the inbox, a search pane, the list of messages, a list of messages in a specific email conversation, the list of different accounts (email, Facebook, Twitter and LinkedIn show up in the same inbox, so you see and write Direct Messages like any other message) and individual messages. As well as the swipe-down menu for the app, buttons on the left and right of the screen cover common actions; it looks messy at first but it works well when you're holding the PlayBook in both hands. Like the mail software, the address book and calendar details for all the messaging accounts you have on the PlayBook. You can tap through from an email to the contact details of the sender, which includes meetings and places you've both been to, people you know in common (based on LinkedIn or meeting invitations), as well as their recent Twitter and Facebook updates, their CV from LinkedIn and a selection of recent news stories about their company, plus whether they're available for a video chat. These are useful but it's a little frustrating that contacts with the same name on different services aren't automatically linked the way they are on Windows Phone), so you won't always see details from Facebook or Twitter for a friend when you click their email address unless you go through and individually link their profiles (the PlayBook doesn't even offer suggestions here). The Calendar interface has some hugely useful touches; days when you have a lot of meetings show up with the date in a larger font in the default month view, and with a strip of colour to show when you have meetings and conflicts. It's too small to see times but it gives you a great at-a-glance overview. Pick a day and you can see a list of meetings or people you're having meetings with as well as the usual hour by hour view. All this makes the PlayBook PIM apps great for staying on top of what you're doing and who with; business users and social butterflies will love this. Developers can take their Android apps and – for about 80% of apps – have them just work on PlayBook, so Android apps are starting to bulk up the numbers in the App World catalogue, although that also means we saw our first Force Close dialog on the PlayBook (where multitasking is normally fast and responsive). The first Android app you open takes quite a while to load; subsequent apps in the same session are far faster as the Dalvik player is already running and all the Android apps you run appear in a single window with a list of icons for running apps at the bottom. The experience is much like using an Android app on an Android tablet, and rarely as fluid as an app designed for PlayBook. Turn the PlayBook on its side while you're reading a Web page and the new Reading View automatically trims off adverts, sidebars, navigation, comments and everything else that isn't part of the main story on the page (it keeps pictures in the story though). Turn it to landscape again and you get the full Web site back. There are other mobile browsers with reading views but choosing this by turning the tablet so it feels like a book or magazine is a superbly intuitive way of doing it. It depends on the site how well this works but it's good for blogs and news sites. The improved keyboard is useful for writing email, and extremely useful in the updated Documents To Go which has lots more options for formatting documents with fonts and bullet points. Sheets To Go supports over a hundred more formulas, so you can work with the most common formulas from your Excel Spreadsheets. You can still only edit or view existing PowerPoint presentations, not create them from scratch, but that's very useful with the updated version of BlackBerry Bridge. 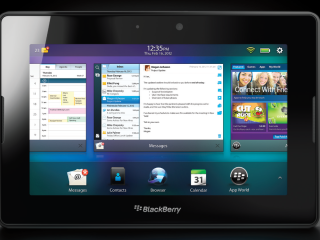 You can still see your choice of BlackBerry apps on your PlayBook when you pair it with a BlackBerry, like BBM. But Bridge now lets you use a PlayBook as a larger screen for your BlackBerry, for displaying a photo or file, or a BlackBerry as a remote control for a PlayBook, for controlling a presentation, pausing a movie without reaching for the screen or typing fast. Put your BlackBerry into remote control mode and you get a blue screen with borders around it; swipe from the edges with one finger to get the same gestures as on the PlayBook for switching apps and opening menus, drag one finger on screen to get a mouse pointer you can click on icons and controls or scroll with two fingers the way you would on a touch pad. Type on the BlackBerry and the text appears in whatever application you have open on the PlayBook (you see it on the BlackBerry screen as well, in a large font). If you're a fan of the BlackBerry keyboard, which still beats the keyboard on just about any other phone hands down, this lets you type at speed and have a big screen for browsing and reading on as well. On the other hand it can also feel like an awkward compromise, with neither device quite good enough to use on its own; we'd also like to see more dedicated controls on the BlackBerry Bridge screen, like play and pause buttons. Instead of dragging out a USB cable just to copy files onto your PlayBook, install this PC software and you can send a document – or a boarding pass or hotel confirmation from a web page – straight to your PlayBook. This is a very clever idea and could save you a lot of paper, but it's a little fiddly in action; it takes a couple of minutes to convert a short document into a PDF and it only works if both your PC and your PlayBook are on the same network. It works well at home or at work but if you're in a hotel or coffee shop, the network setup may stop the PC and PlayBook being able to see each other. Even though you have to sign in with your BlackBerry ID the document isn't being sent through RIM's servers; they just authenticate the connection and then the file is transferred directly from one device to the other. You can only search for documents by title as well, not by the contents. If you use OneNote on your PC, you can get a much neater version of this idea, with full search, using the Send To OneNote printer driver, the OneNote app for iOS or Android (or Windows Phone) and a OneNote notebook stored on SkyDrive. There are some great ideas in the new PlayBook OS, with some genuinely innovative thinking about how to work with a tablet that's not going to be the only device you use. This is definitely the tablet RIM should have brought out in the first place, but good as it is, it's still not sweeping away the competitions.